A fun and fast way to spend your holiday: come to Daytona for the Daytona Coke Zero Sugar 400 NASCAR race, July 5th-7th at the Daytona International Speedway. One of NASCAR’s most anticipated events, the Coke Zero Sugar 400, brings together NASCAR racing under the lights with pageantry and patriotism to make for an Independence Day weekend celebration unlike any other. This fan-favorite event includes some of the most exciting racing of the season as drivers battle three-wide for a coveted DAYTONA victory. Pack up your cooler, swimming pool and RV, and be sure to bring your family and friends as the holiday weekend and friendly prices truly make this a family event. You could build a week-long vacation around this exciting event to take time to enjoy some of the sights in addition to the race at the Space Coast. On July 5th, you can enjoy NASCAR XFINITY Series practice, the Monster Energy NASCAR Cup Series practice as well as the NASCAR Racing Experience Ride-Along Program at Daytona. All this week the University of Northwestern Ohio (UNOH) offers its Fanzone hands-on racing experience. On Friday the 6th, there is more Ride-Along time as well as the Midway and the UNOH Fanzone. Then the NASCAR XFINITY Qualifying race, followed by Monster Energy Cup Series Qualifying race and then in the evening is the Coca-Cola Firecracker 250 race. And finally on the 7th, (the Big race day), you can enjoy a concert by Josh Turner, multi-platinum, Nashville-based singer before the race. The big race starts at 7 pm: the 60th Annual Coke Zero Sugar 400, followed by evening fireworks after the race is complete. For more details about the race schedules, the entertainment and the venue of Daytona International Speedway, see their website. 1) You can camp right in the middle of the track if you book early enough: Any DAYTONA veteran will tell you that you haven’t truly experienced the “World Center of Racing” until you’ve loaded up the RV, called up your closest friends and set up camp somewhere in the 180-acre infield. You can camp from the 4th of July to the 8th right in the track. Whether you’re in a decked out motor coach or a tent is more your style, DAYTONA offers a camping option that puts you right next to all the history and heritage that’s made this place world-famous. For more details, see their website. If Daytona Speedway is all booked, you can still park your RV nearby at a number of campgrounds in the Daytona area or just a bit south at New Smyrna Beach. 2) Daytona Racetrack RV- closest campground to the Speedway – located just across the street. While here, take time to enjoy some of the other sights and natural beauty of Florida’s Space Coast. Lighthouse Point Park is at the southern tip of Ponce Inlet. The natural beauty of the undisturbed land has been preserved for all to enjoy. Dolphins frequent the shoreline, gopher tortoises can be found in sandy areas, and other wildlife (including raccoons, possums, skunks, armadillos, shore birds and birds of prey) can be observed. Lighthouse Point Park is one of the few County parks where man’s best friend may enjoy the amenities. However, pets must be leashed at all times. Visitors to Smyrna Dunes Park may arrive by land or by sea. Perched on 73 acres of pristine land at the northern tip of the New Smyrna Beach peninsula, the area is surrounded by water on three sides. Waters from the Indian River flow through Ponce Inlet and into the Atlantic Ocean providing a variety of fishing or swimming venues for park goers. The park also provides a unique opportunity to see a wide variety of animals, birds, reptiles, marine life and vegetation in their natural habitat. The surrounding waters provide excellent fishing, boating and swimming opportunities. Located about 30 miles south of Daytona is this unique national treasure. You can even enjoy backcountry camping here if you like, just in view of the launching pad of Kennedy Space Center. Check out their website for more details. Don’t forget the beach! Daytona is one of the prettiest beaches on Florida’s east coast and one of the only ones that still allows motorists to drive right on the sand. Sunbathers and swimmers can park their vehicles within 30 yards of the surf, enjoying the convenience of having their car parked nearby. 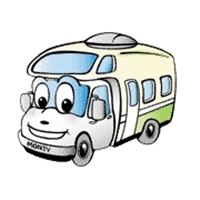 To rent an RV for your trip, check our Orlando RV Rentals location. Though this may sound like an inopportune time to visit the Everglades, there are several advantages to exploring this vast wetlands National Park in summer. With plenty of room to explore without crowds, the Everglades are the perfect adventure during the wet season, when frequent rains and heat scare many people off. If you come prepared with sunscreen and a hat, you’re likely to see scores of alligators going about their business, making the Everglades thrilling for nature enthusiasts and wildlife photographers looking for the perfect picture. Transition periods – like late April to early May are always a busy time. Tours are popular on Memorial Day weekend. Plus, alligators experience an active mating period in the spring, and with summer months just ahead, the wetland is preparing to create new habitat for wildlife to thrive. In late August, you can actually hear the cries of new baby alligators getting ready to roam. In the Everglades, water levels change dramatically from month to month, creating unique differences between the wet and dry seasons. The Everglades is the single-largest subtropical wetland ecosystem on the continent and is home to 36 threatened or protected species including the Florida panther, the American crocodile, and the West Indian manatee, and supports 350 species of birds, 300 species of fresh and saltwater fish, 40 species of mammals, and 50 species of reptiles.(Wikipedia). More than seven million people – or one-third of the state – depend on the Everglades for their water supply. The park is the most significant breeding ground for tropical wading birds in North America and contains the largest mangrove ecosystem in the western hemisphere. Everglades National Park has three entrances in Homestead, Miami, and Everglades City. Please note, these entrances do NOT interconnect. Main Entrance: This entrance connects visitors to the Royal Palm and Flamingo areas of the park. It is open 24 hours a day. There is an entrance fee collected. If you are interested in taking a boat tour or renting a canoe, kayak or other boat at Flamingo, a separate fee applies. Shark Valley Area: Open daily from 8:30AM to 6:00PM. There is an entrance fee collected at the gate. Separate fees apply for tram tours and bike rentals. The park remains open 24 hours, but vehicles do not have access after 6:00PM. Gulf Coast Area: Open 24 hours a day. There is no entrance fee collected at this entrance; however there are fees for boat tours and canoe rentals. The above are all National Park locations. In addition, there is another attraction west of Ft. Lauderdale at Griffin Rd and US 27. Everglades Holiday Park features gator shows, airboat rides and fantastic bird watching. In this park, you also see creatures in their natural habitat. The park is a working rescue operation and an educational park that is raising awareness of the importance of conserving natural wetlands. Long Pine Key Campground, near Florida City near the Homestead entrance to the Everglades. It features 108 individual drive-up sites for tents and RVs available first-come, first-serve for $20/night. Reservations are not accepted for individual sites. However, they are closed during the wet season so save this one for November through April. Flamingo Campground: Camping on the edge of Florida Bay offers spectacular sunrises and sunsets. Camping is available year-round! No reservations are needed during off-season months between April 16 – Nov.19. During the summer wet season, portions of the campgrounds may be closed due to flooding. Flamingo campground is in a big open field with few trees and strong breezes can be felt from winds coming from Florida Bay. The campground features solar-heated showers, two dump stations, picnic tables, grills, and an amphitheater for winter programs. Flamingo has several hiking trails and canoe trails, and opportunities for saltwater fishing are plentiful. More than 300 species of birds spend the winter in Everglades National Park, and there is ample opportunity to see crocodiles and manatees in the marina area where you can find services, boat rentals, tour boats and the Buttonwood Café. Bring your kayak or canoe to explore backcountry trails, and small motorboats (5 HP and under) are allowed in many areas. Flamingo Campground is located 38 miles south after entering the main park entrance in Homestead. If you prefer to camp outside the park grounds, there are several other RV campgrounds nearby in Homestead and Florida City. Driving north from the Everglades, you are only about an hour away from Miami where you will want to take advantage of some extensive sightseeing. Visit Monkey Jungle, where humans are caged and monkeys run wild. Or if you are in the humor for more culture, tour Vizcaya Museum and Gardens (an Italian palace said to have been constructed using real, imported Italian marble) take a walking tour to plenty of art museums. Dine along South Bayshore Drive in Coconut Grove and spend the day where Crockett and Tubbs made Miami famous. And, El Monte RV’s Miami location is right nearby, about 10 miles south of Coral Gables, if you need to rent an RV for your Everglades adventure! From glamping weekends for ladies only to summer camp for adults, the adults only camping craze is catching on. RV campgrounds have led this trend, with over-21 and over-50 campgrounds located across the country. If you long to find an RV camping destination where the kiddies can’t come along, our guide to adults only RV campgrounds is a good place to start. Camping for adults only comes in a variety of styles. Let’s look at the most common options available for adults who prefer to camp without kids around. The first type of adults only campground is the over-21 RV resort, where activities and amenities cater to adult campers. A quick check of the what’s offered at Edge-O-Dells Resort in Wisconsin will give you a good idea of what’s out there. Guests there enjoy an on-site restaurant and bar with live music, a large pool with hot tub and quick access to the local casino. Special events like weekly Bike Nights keep the party atmosphere humming, a common theme for campgrounds that cater to the over-21 crowd. If you’re hoping to find a more peaceful adults only setting, Wild Duck Campground and RV Park in Maine’s Scarborough Marsh is a good example of an over-21 campground for nature lovers. This type of campground tends to be situated in pristine natural settings where outdoor recreation is easy to access. No matter which style camper you are, you should be able to easily locate a no-kids-allowed campground to suit your fancy. With so many seniors choosing full-time RV living, there’s been an explosion of over-50 campgrounds to meet their needs. From long-term campsites for snowbirds in states with mild winter weather to overnight camping for older campers on the move, RV resorts for seniors understand the needs of the over-50 set. One of the ways these campgrounds attract a steady stream of RVers is by offering a range of amenities to appeal to active seniors or older campers who prefer to stay close to the campground, as well as retired campers who’ve chosen to pursue an ‘encore career’ while on the road. Cable television and wireless internet, exercise classes or facilities and venues for outdoor recreation such as golf, fishing and hiking nearby top the list of features seniors look for in an RV resort. Need an example of what might be available if you’re one of the flood of older campers hitting the road? Winterset RV Resort on Florida’s Gulf Coast keeps campers happy with an on-site wood shop, fitness center, business center and a full schedule of planned activities. They welcome both long-term ‘snowbirds’ and overnight campers fifty-five and over. Where can you find a campground that doesn’t allow kids? An easy way to start your search is by checking the online directories of RV clubs. Passport America and Good Sam members, for example, can search for adults only RV resorts and then add additional search filters to find the amenities they prefer. A simple internet search for “RV campgrounds for adults only” or a similar search phrase will also yield many pages of options to explore. You can narrow down your search online by adding the state or city you’d like to visit. Once you’ve found the place that sounds perfect for your next RV camping vacation, be sure to read their Rules and Regulations page so you’ll know if there are restrictions on things like pets and under-age visitors. Check their schedule of activities and outdoor recreation options. You may find you can enjoy a well-rounded vacation taking advantage of what’s available free for RV park visitors. Camping without kids can be a nice break for parents or an RV-lifestyle choice. Whatever your reason for choosing a child-free campground (or seniors-only resort), we think you’ll be pleasantly surprised at what’s available near your chosen destination.